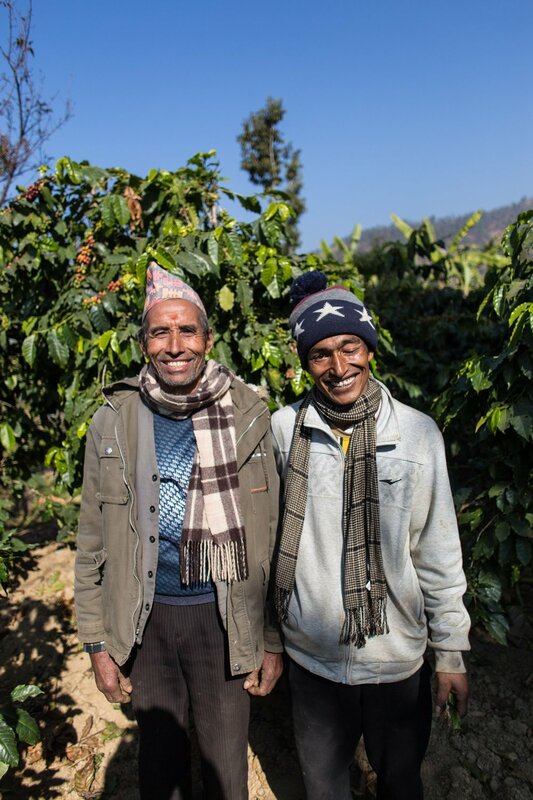 Coffee: The world’s favorite drink, and the key to bringing reforestation and revenue to the farmlands of Nepal. For Conscious Impact and the community of Takure, 2019 is the year of coffee. It has been three years since we planted the first 10,000 coffee seeds in our greenhouse, and this year many of these seeds (now small trees planted throughout the mountains) will finally give their first fruits. Our partner farmers across the region are excitedly anticipating their first harvest, and the income that will come with it. We at Conscious Impact are hoping that the dream will come true: financially profitable reforestation across the hillsides of Nepal! Our team is preparing for 2019’s first harvest by constructing Takure’s first ever coffee processing center. With space for pulping, soaking, drying and storing the coffee, this agricultural center will become the new hub for organic coffee processing and distribution. Plus, with space for an office and meeting area, Takure’s Coffee Cooperative will serve as a central gathering space for passionate locals to meet and plan the future of organic farming in the area. We can’t wait for the space to be operational! This week, we completed the 6th course of the new earthbag Coffee Cooperative Office and Meeting Hall.. This construction will be completed by April, 2019 and will provide the region’s farmers with a place to process and store their new coffee harvests. It will also host trainings for organic agriculture, tree care and compost management. We are now two months into the construction of the new Coffee Cooperative in Takure and already the progress is inspiring. The gravel foundation is complete, and now the earthbag walls are going up! 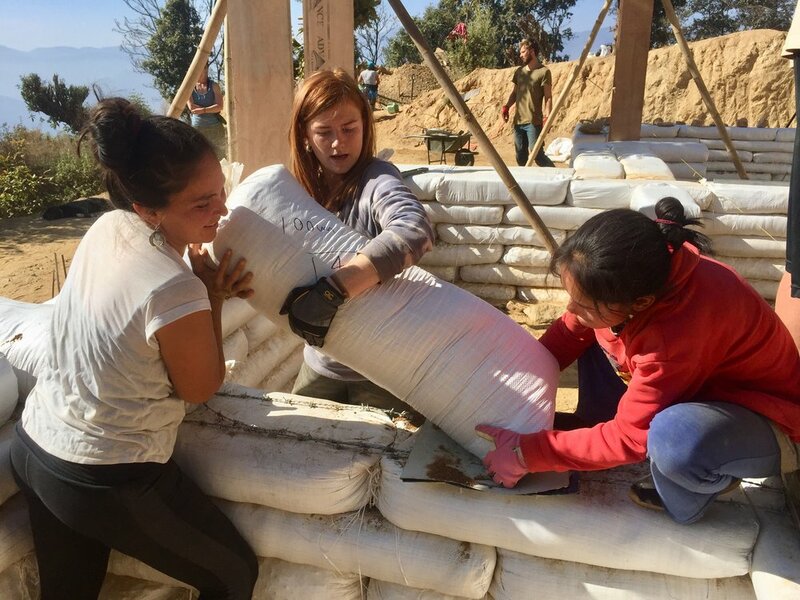 Over the past 3 years, earthbag construction has become one of Conscious Impact’s favorite building techniques. 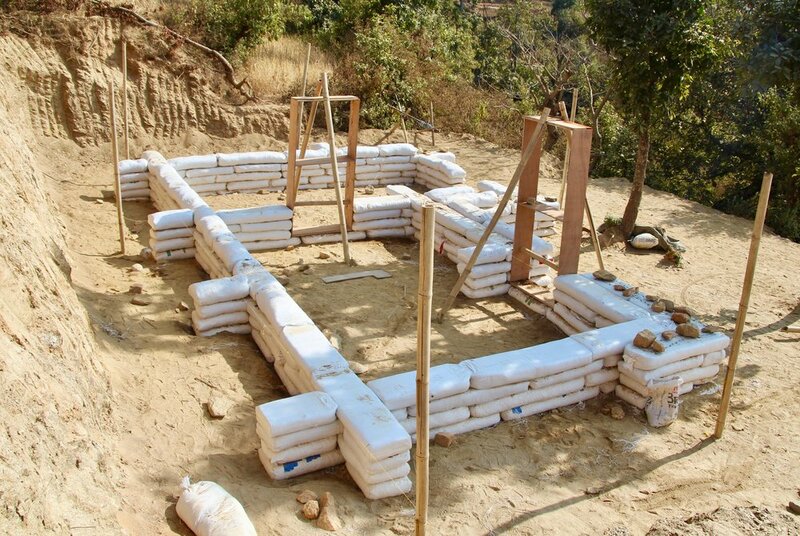 Besides being affordable and easy to build, earthbag construction is extremely low impact, environmentally sustainable and very earthquake safe. Plus, the local sandy and silty soil is perfect for filling the earthbags. 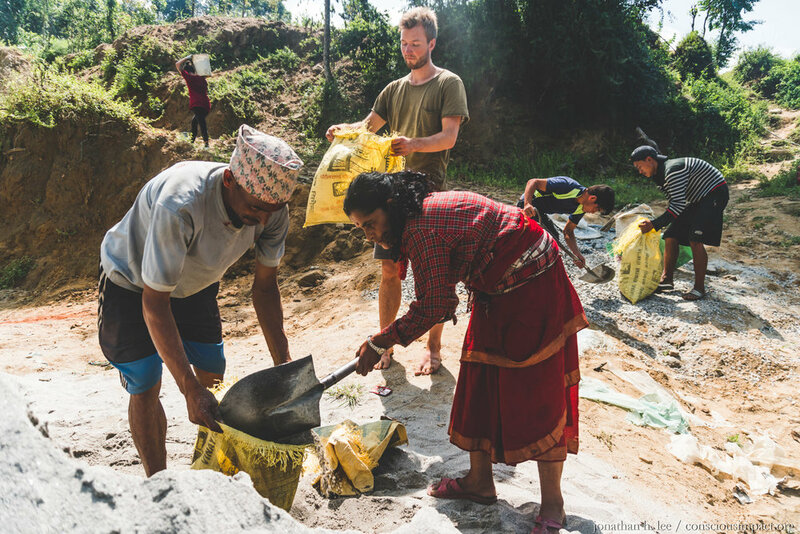 This is our third earthbag project, and we hope to build many more in Nepal. Conscious Impact volunteers filling earthbags during the construction of the new Takure Coffee Cooperative. We are so grateful to all of the volunteers that have given their labor to this project already, and to everyone all over the world that has supported the Coffee Cooperative. We want to give a special shout out to Ali and Fayza for their generous donation to make this project possible. If you are still considering becoming a donor to Conscious Impact, please visit www.consciousimpact.org/donate to support this project and many others in Nepal. We are forever grateful! And of course, we are always looking for more volunteers to come to Nepal to get their hands dirty with us and learn how to build with earth. Check out our upcoming programs at www.consciousimpact.org/volunteer and see you in Nepal! The Agriculture team here on the ground has some truly exciting updates! With the completion of our newest bamboo greenhouse, we were able to plant about 4,000 Moringa seedlings, of two distinct varieties. Moringa Oleifera is native to foothills of the Himalayas, exactly where we are currently located. The second variety, Moringa Stenopelata, grows at high altitudes in Ethiopia and Kenya, which is also fairly similar to Takure's altitude. Moringa is a tenacious and fast-growing tree, that can grow 2-3 meters in less than a year. It can be grown alongside to provide shade if grown in a sunnier area, or by itself in the clear sun. The Ag team plans to distribute these trees shortly before the monsoon season and hopes to have them established before the heavy rains fully arrive. It's deep taproot won't have to compete with other vegetable and field crops for ground nutrients. It is drought tolerant and will do well during Nepal's 9-10 month dry season. The leave can be ground into a fine powder which has a high market value. Their long bean pods that can also be sold for 50 rupees/kg at market. It can help alleviate malnutrition because it is high in Vitamin A, C, calcium, potassium, phosphorous, iron, and is a complete protein. It's nutrient-dense leaves increase milk production in cows. Providing a space for experimental growing is one of the biggest advantages that the CI Ag team can provide for the local community, an opportunity to see if a lucrative crop like Moringa can grow in this exact terrain and altitude. More importantly, it supports our initiative to reforest this area, reinvigorating the surrounded environment, preventing terrace erosion and circumventing the danger of landslides in the future. Narayan Bhatterai is the local leader for Conscious Impact's agriculture program and was recently named the chairman of the new Basic Organic Coffee Cooperative in Takure. Out of affection, we call him Narayan "Mama", which means "uncle" in Nepali. A: Namaste, my name is Vishnu Bhatterai, but people know me as Narayan Bhatterai. My house is in Nawalpur, Takure Ward number 4. In some ways, my life has been painful. Because nobody can say, “My life is full of happiness.” Everybody has their own pain. Everybody has their own suffering. My life has been different than others in certain ways. I didn’t receive the warmth of love from my mother and father. I never got the chance to realize what that kind of love was like. When I look back on my childhood, there was a lot of suffering. It doesn’t matter how many times you’re injured, because when you are able to heal, you are stronger. In my life now, I have a place to be satisfied. There is a reason we pick from the edge of the river when choosing a loro (stone pestle). It is those stones that pass through the most struggle and hardship, making them strong. They are the best for the work that needs to be done. "It doesn’t matter how many times you’re injured, because when you are able to heal, you are stronger." My father died when I was 1 and a half years old. I never knew the face of my father. When I was 7 years old, my mother remarried to another man, and then left him. After that, my life was not so easy. By the age of 14 -15, I went to live with my maternal uncle. I grew up there, and I was able to complete some of my studies. After that I went back to my house in Takure, and got married. Right now I have 5 members of my family. My two daughters are a blessing from God. They are so much better than me. I forget all my pain when looking at my family. I am satisfied. The earthquake brought a lot of pain and sadness. Yet after this sadness, to some extent there is always happiness, because we were able to find a new family in Conscious Impact. I met them, and had the chance to sit with them, talk with one another and recognize each other. All of this is such good luck. This is a good opportunity, because every challenge has possibilities and every possibility has challenges. This is my experience. "There is a reason we pick from the edge of the river when choosing a loro (stone pestle). It is those stones that pass through the most struggle and hardship, making them strong. " I have a simple family and don’t have so many fields for farming. I have one cow and two baby cows. The cow gives me milk. I have 5-6 goats. Simply our life is going on. Maybe I’m not able to fulfill all my children’s wishes, desires, and happiness. But I am trying. I am trying to give more than 50%. If I am able to at least give 51%, I can be satisfied. And when it comes back to 49%, that is my bad luck. A single individual makes up one part of the whole, while the community makes up the bigger part. If society improves and develops, then your village, your tole (small community), your VDC, will also grow to be better. Just because your neighbor is rich, doesn’t mean that you are poor. This is a way of thinking that still exists, and hasn’t disappeared. I hope that it doesn’t. I am satisfied with this way of thinking. The benefits we receive as individuals are not large. We are not taking any things with us, yet we try to earn so much to have sufficient things. We come into this world with empty hands, live in nature, step on this earth, breathe the air, drink the water, get warmth from fire. And when we die, we leave empty handed. We reach again the water, and are burned by the flame, mixing our soul back into the fire. We take only the satisfaction that we drew from our own lives and the thoughts that others had of us, when we die. "We come into this world with empty hands...And when we die, we leave empty handed...We take only the satisfaction that we drew from our own lives and the thoughts that others had of us, when we die." Q: What role does agriculture play in your life, and why is agriculture important to you? A: When I was in class 8 or 9, I learned that Nepal is an agricultural country. About 87-90% of people rely on farming to live. Slowly, there was a decrease in production because people were becoming less interested in agriculture. This is sad for me, and for everyone. Everyone has begun flying to other countries for work. People are constantly fighting one another for government jobs, or for any kind of work. The number of people that focus their time on agriculture is decreasing day by day. This really hurts me, because we are sacrificing so much to try and work abroad, giving so much blood and sweat working for someone else in a different country. Increasing population, the population density, unregulated farming methods, the use of chemicals and unnatural fertilizers -- all of these things are leading to less income generation and more expenses. Because of all these things, people are moving away from agriculture, and just trying to find easier work. Because of all these reasons, agriculture is the most important thing. It is life. Along with this, agriculture protects the whole world. Agriculture takes care of all human beings and animals. Because of all these things, I am more interested in agriculture, and more attracted to agriculture. Q: Why are you interested in growing organically? A: When we adapt to organic farming, I believe that the soil that is now dying will slowly regenerate. If the soil is good, we’ll be good as well. If soil is healthy, you will also be healthy. Thinking about all these things, we have to make the soil healthy and more fertile. If we make the soil unhealthy, then we will also be unhealthy. Maybe we’ll be able to make money just for the present moment, but we cannot avoid questions about what we will do in the future? Now it seems we are too late. We have made the 5 elements of our world impure and muddled. We are human beings who have a big responsibility, but we are becoming selfish and only focusing on our individual needs. Air, water, earth, and soil -- all these things are our life. Yet we think we can challenge these things, and move forward with the wrong concept of trying to control them. "Challenging nature is a foolish thing. We use the word 'development, development' but it is only bringing destruction. If we forget to keep a balance between development and destruction, or our future generations will resent us." Challenging nature is a foolish thing. We use the word “development, development” but it is only bringing destruction. If we forget to keep a balance between development and destruction, or our future generations will resent us. Meditating on all those things, the only way to make soil healthy is through organic farming. Q: How did Takure move away from organic farming and start using chemicals? A: In 2036 B.S. there was a huge famine. I had only heard about this because at the time I was only 2-3 years old. After that, chemical fertilizers became popular to use, and people were so happy to see the very quick increase in abundance. In the last 30 years, we have given birth to unheard diseases and unhealthily polluted air and water. Because of deforestation, and the use of unnatural fertilizers and chemicals, the soil is not able to bear the load, because everything has balance. Now it’s time to think deeper. Even if we aren’t thinking about it right now, imagine what will happen if we continue using chemicals and fertilizers at this pace. Deforestation leads to landslides and flooding, and yet we are continuing these practices. And the use of chemicals will leave future generations with nutrient-less, poor quality food. "Deforestation leads to landslides and flooding, and yet we are continuing these practices. And the use of chemicals will leave future generations with nutrient-less, poor quality food." Only the owners of those companies who make chemical fertilizers are earning money. Farmers are investing money, and making money, but losing more. Even if we do hard work into the future, by the end of it we will not have a good environment for farming anymore. Still we have time, and if we coordinate with each other, getting helping hands, it won’t be too late, even though there’s little time left. We can stop all this destruction and save the soil. We can give life, and to give life is to give a future for our children and to save our world. Along with this, it’s important to keep ourselves healthy, not only yourself, but all creatures, and the whole planet. With continued support, interest, and help -- one day Takure will be a place that is again fully organic. I am hopeful that one day it will be like this. Q: What does partnering with us to bring organic coffee to the community mean to you? A: I was in my own lifestyle and my own way of thinking. After the big earthquake, you chose to come here after seeing our pain and suffering. We were given the chance to receive this help. "Even before the earthquake, day to day life was difficult. After the earthquake, it was like we were left naked. It was a pitiful situation. " Even before the earthquake, day to day life was difficult. After the earthquake, it was like we were left naked. It was a pitiful situation. There were no businesses around or government services or jobs in this area. For the five of us in my family, it was very hard. Without work, it is so hard for me to take care of my family. When you [Conscious Impact] came along many villagers received job opportunities. Not only jobs, but got the chance to serve our own community. Brick making is a service to the community. We now have a coffee nursery. And this is not just for one individual, but for the community. If the community will rise up, I can also rise up. I am the smallest part of the community. Not only me, my society, my community -- we need to stand up together. We all need to understand what the truth is. This is my expectation. Even though we may not be able to help with every sector, with the help from Conscious Impact we’ve started a nursery, we began growing 10,000 coffee trees, and next year we will plant another 10,000 coffee trees. Slowly in 3-4 years, we will have 40-50,000 coffee plants. This will be a great source of organic farming. Along with this, people’s standard of living will be improved. Growing this organic coffee will mean not having to work as hard every year because we will not have to plant every year. We just have to plant once, give care, and provide water. If you wait for 2-3 years, then you will regularly be able to make income for 40-50 years. On one side, it is beneficial for human beings as a source of income, and on the other side it is beneficial to the soil because it is grown organically. It is healthy for us as human beings. "Growing this organic coffee will mean not having to work as hard every year because we will not have to plant every year." You [Conscious Impact] have given so much inspiration, so much help, and you’ve made us so much more enthusiastic. For this, we want to say thank you. I hope this community will take this in a positive way. Truly, we don’t have to just focus on temporary happiness, and we have to think about the future. I want to thank Dheeraj Mishra for bringing Conscious Impact to Takure. I want to thank my community as well. Meet the "Basic Organic Coffee Cooperative"
Our "Basic Organic Coffee Cooperative." Elected chairman Narayan Bhattarai stands third from the left and the Sakute offical stands third from the right. The committee is 3 men and 4 women, and represents 4 different casts within the community. 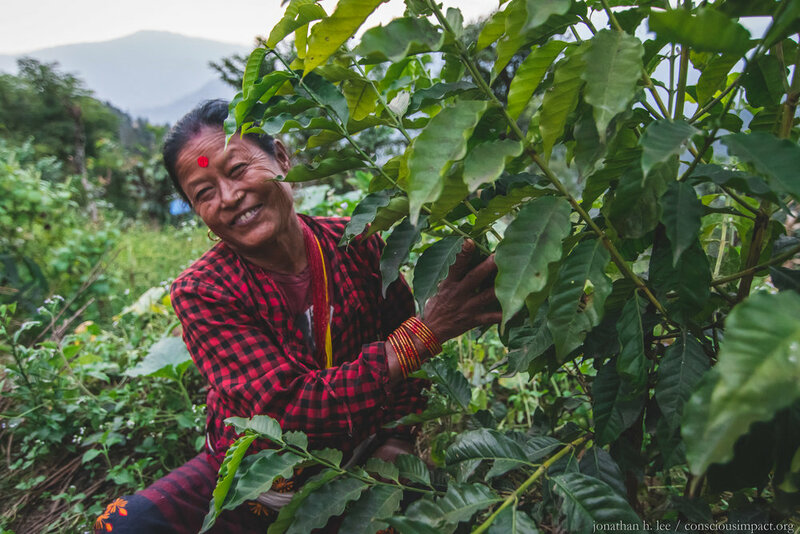 This week with the help of our own Greg Robinson and Narayan Bhattarai Mama, Conscious Impact formed the Takure branch of the Nepali based coffee cooperative! On Saturday we were excited to set up a training with a representative from the Sakute Coffee Cooperative in Nepal and the local community. Sakute is a town in Sindhupalchowk, the same district as Takure and only a short bus ride away. A representative from the cooperative came to Takure this week to provide a training regarding the structure, requirement and benefits of the co-op model. To join the cooperative members were asked to provide citizen cards and passport photographs. We are so excited that 46 women and men turned in their paperwork and the cooperative has officially formed! We now have 26 members from Takure and 20 members from Bimire. Others in the community will still have the opportunity to join in the coming years. Members meet for a training with a representative from Sakute. The cooperative has been named the "Basic Organic Coffee Coopetavie." Basic means to be directly connected to the earth through simple and organic means of farming. Apart from forming the cooperative, the members sat together and elected a 7 person committee to represent the "Basic Organic Coffee Cooperative." Narayan Bhattarai was unanimously selected as the chairman of the committee. Of those elected as representatives 4 were men and 3 were women. The elected committee represents families from 4 casts, Brahmin, Tamang, Magar, and Dahal. We're so excited for this opportunity to have women and men working together as well as families form 4 casts. A huge thank you to our agriculture team and Mandu Tapa (third from the left). The cooperative is Nepali run and organized and supports an equal women to men committee. The chairwoman of the cooperative is Mandu Tapa who has been extraordinary in helping us form the Takure/Bimire branch of the cooperative. We are incredibly grateful to everyone who has been a part of forming the cooperative. None of this would be possible without the support of volunteers and donors from around the world. To learn more about our More Than a Tree campaign and supporting the farmers of our community click HERE. Please consider donating to help us continue this project, and for every $1 donated one tree is planted!! DONATE NOW! A note from the interview: Buddha Tamang is an elderly Buddhist man living just down the hill from Conscious Impact's camp. His friends in the village could only praise him for his love of organic farming and dedication to his plants and trees. We knew we had to meet him. He is a permaculture enthusiast in every definition of the word. He plants in a way that benefits all the living things near and on his land. His trees are intermixed with crops and everything he grows has a purpose. His devotion to Buddhism is directly reflected into the way he farms. Buddha has often said he loves his trees as much as his children. He loves to talk about his life, his plants, and how he has coped through major distresses including the passing of his wife and the 2015 earthquake. Buddha is now a close friend, a coffee co-op member, and a mentor, we visit him often. Q: How is your way of planting trees different, and what is special about that? A: My original home is not here, but in Daduwa. When I first moved to this land there was not a single tree. This land was just for grazing animals for the people of Takure and Dude. From that corner of land to the other, in the 15-20 ropanis (2-2.5 acres) of land, I could only collect 1 basket of grass. All that I have planted I brought from somewhere else. This tree here, has grown here (pointing to large tree behind him). This land had no plants or trees, when I first bought plants, I didn't know how to grow them. Then I learned how to use compost. There wasn't any grass for my animals to feed on, so I learned to grow grass. Now this time, there won't be wood shortages or problems. We grow trees for wood and bamboo to make baskets. Before we used to carry everything in rice sack bags, but now we use bamboo to carry things and make baskets. When my wife was sick, I learned how to grow fruit trees, specifically lemon trees. I took my wife to India and other foreign countries. I would carry around lemons in my pocket to put in water when I wanted to drink. When she was in the hospital there was no one at home to wash my clothes. I took off my jacket and hung it in my house and did not wash it for a year after she was sick. After one year, once she had passed away, I reached for my coat again, and found the same 2 lemons, but now they had become dry. When I opened them, there were 11 seeds. I wanted to know if they would grow, so I planted all 11 seeds in the mud. I wanted to try, and all 11 seeds grew. I planted the 11 trees in small plastic bags. I put soil and compost inside the small black bags, and placed them under the shade of a tree for 2-3 years to grow. I gave them water and took care of them, even though I didn't have experience, I dug 11 holes to plant the trees. I planted them too close together, so when they grew the branches touched each other. After my wife died, I traveled to so many places and saw many people doing tree grafting. I watched and learned how to graft by watching other people do it. I eventually did the same for my plants. Through tree grafting, I was able to grow 80 lemon trees. All these trees, especially lemon, are from grafting. I used to have more trees, but 20 trees were destroyed when the government expanded the road. "I want to build a garden around this land. Gardens need to be cared for. They need water, and medicine, everything. I want to make this place a garden. That's why I'm doing this." There was no system that allowed my son to stay home and work in Takure, because there were no jobs available. Like the heavy rains that wash away everything in its path, my wife died, and I was left alone. I was left having to pay back 14 lakh rupees in loans, which I had spent on my wife's medical treatment. And even after she died, I spent so much money on her death ceremony and funeral. Because of the need to pay back these loans, there was no way for my son to stay home. My son, when he comes to stay, is more like a guest. Not out of his own interest, but because he is obligated to work. Throughout all this, I had wanted to build my house. I have so many plans to work on my land. I have a problem where there is not enough water. I want to make the land level and build a dam to store water. I already have a small pond. I want to plant different types of fruits and vegetables, like onion and garlic. Anything can grow in this soil, on this land. If there are problems with starvation for 2 months, we will survive because I have grown so much food, like yams and sweet potatoes. I planted all different types of wild yams and sweet potatoes all over this place. Q: What are your dreams and vision for your land for the next 50 years? A: In my view, I want to make it a better place. I've only done experiments on this land, and haven't really benefitted from what I grew until now. Now I've seen I can do what I want to do. My son and grandsons, are all involved with the agriculture on this farm. Everyone's heart is in this work and land. Right now, why go to America or the UK or Korea or different countries? If we can plant trees and fruits here, we will have flowers, and now I have bees. We can create benefits from all these things. Nowadays, there are roads and markets everywhere. You can use vegetables for eating, you can sell them in the market, and you can send them far away to be sold. Onions, garlic, and green vegetables are essential. We need them every day, morning and evening. If you have extra vegetables, you can sell them, and then you don't have to buy it. I will manage the problem of water, and I will grow different kinds of fruits and vegetables. It is hard work doing agriculture, but there is no other option. This is what I want to spend my time doing, putting all my energy on this land. Not just for myself, but for my grandson. My grandson has a good education, and it is good for him to do this work because he has knowledge. That is why our dream is to manage this place, and to have guests like you from far away. I have experience, I just don't have enough resources or economic power. I have less income and more expenses. "Right now, why go to America or the UK or Korea or different countries? If we can plant trees and fruits here, we will have flowers, and now I have bees. We can create benefits from all these things." If we look, there is nothing to do. But if we just do, we find what there is to do. We have so many bamboo trees, so we can make so many things from them, but we need the skills to learn how to make these things. What we need is skills. How to plant trees, how many trees need to be planted – all these things need to be learned. I have 6 children/grandchildren. All of them are going to school, being part of society, attending ceremonies and inviting everyone. If for 2-3 years, you are all coming and going from this place, you'll have the opportunity to see these changes. If one person died, we don't have to stop doing things, because dying is a natural part of life. In 2-3 years, I want to decorate this place like a bride on her wedding day. I may die, and I will not be able to do this, but my son and grandson will be able to continue this work. Q: There is a large tree behind your house and there are many pigeons living in it. Have you built these homes in the tree for the birds? A: Before the earthquake we had a two story building here, and the 2nd floor was a just for pigeons. There were 500-600 pigeons there. I don't keep pigeons, but I give them grains. Because of the earthquake our home was destroyed. After that, there was such a horrible smell. We realized it was the smell of pigeon poop. 500-600 pigeons produced 80 sacks of poop for compost and I collected all of this. "If we have to climb up, then we will also have to climb down – there is always both happiness and sadness. We have laughs and tears, life is like this. Even if you feel right now everything is okay, maybe it won't be later." We dug a hole under the lemon tree and put all the pigeon poop there and covered it. You can see the lemon tree is still flowering and giving fruit. After that, the pigeons were still living in the damaged house. We didn't have any space for them to live. Just like human beings, who also didn't have anywhere to live after the earthquake. But still they would come at night and live there. We believe that 50-60 pigeons were eaten by cats. For agriculture, when it comes to rice, millet, wheat, corn, black beans and other different kinds of beans, you will not understand if I tell you all the different things I know about these crops. I am the child who did so much agriculture and still I am doing. Now I have so many hardships because of my wife. I have experienced so much pain because of my wife. I was not even 50 years old when she died. It is not worth it to love someone who has died, but it is worth it to love those who are living, that is why I love my children. I get so much happiness and so much sadness from everything I've experienced in my life. I traveled so much. If we talk about India, I went to Calcutta, New Delhi, and many other cities in India. I also went to West Pakistan. In my country, I went to Rolpa, Dolpa, and Gorkha. I have so many experiences through traveling. Time did not give me the chance to do everything. I am not hopeless, nor am I overconfident. Everything is good with me. I am okay. I am not jealous that other people are earning more money. If anyone says anything, it doesn't make me feel bad. If time favors me, I am going to be able to do so much. We have to travel to different places inside and outside our own countries. And if you will come here sometimes, you will see all the changes that I want to do to this land. I have planted 150 Lapsi trees around here and I have cut some of them for wood. I have also planted 50 chestnut trees, one variety that you can open with your teeth and the other you have to crush with stone. Now they are bearing fruit. We came to this land just 30-35 years ago. "You ask, I will answer. Or I will just speak alone like a crazy person." If we have to climb up, then we will also have to climb down – there is always both happiness and sadness. We have laughs and tears, life is like this. Even if you feel right now everything is okay, maybe it won't be later. Time is powerful, and we have to move according to time. We cannot say, "No I can't," due to the power of time. Durga stands in her field with two of her young daughters. Q: What is your name, where do you live, and what do you do for a living? A: My name is Durga Koirala. I live in Takure with 5 family members, including myself. Two others are in Kathmandu and another lives in my uncle’s house. Sometimes they come home, but not often. The five of us stay here to do all the household work. I have one son, one daughter who is already married. Now five left waiting to be married. Q: What does it mean to be a female farmer in Nepal? What do you like the most? What is challenging? A: It is hard. I am getting a little help, which helps pay the school fees for my children. People ask me how I’m doing, all these things. Before they said they would provide a job for one of my daughters, but now they are saying they won’t. My other daughter says it is not possible to work in Takure. She will only find work in Kathmandu. Who will help her find a job or a place to stay? My son still has to study. I provide some education to my daughters, but I have to spend money on my son’s education. He is small. Q: Is farming sufficient to provide your family with food for the whole year? A: No. Sometimes we have to buy food. Nearly half of what we eat we have to buy. This year we had enough corn to feed our buffalos, but not our family. We are not able to take care of all of the buffalo, and have to sell one. We are not able to get sufficient production from our farm because of problems with monkeys and insects. We don’t have a sufficient water supply for our fields and for our crops. This year we planted corn in the month of Jestha (Nepali month). We were not able to plant millet and that is why we don’t have sufficient food from farming. I have one coffee tree. It already has some fruit. Last year I didn’t pick any of the fruit because I was busy building my house. This year I will harvest it. Before last year I was able to earn 700 NPR (~7 USD) from the coffee tree. After my husband died, I planted this orange tree and now it is bearing fruits. "My other daughter says it is not possible to work in Takure. She will only find work in Kathmandu. Who will help her find a job or place to stay?" Q: Does you have access to enough water for your plants? A: No. Because of the water problem, I have so many difficulties. People fight for water from the tap. Q: Did you grow up farming? What is your favorite memory of farming as a child? A: I didn’t work during my childhood. After I was married, every year I gave birth to a new child. My husband is the one that used to work in the fields. Before he died, he did all the farming, grew all the millet, and took care of all the animals. Now that he is gone, I have to do it. But even these days, I have my daughters to do a lot of this work as well. I have to take care of the house, and all other household chores. When it is necessary for me, I will leave the house and go run errands. For the government funding, I recently left to go receive it in the city. Not only now, but I’ve had so much suffering and hardship during my childhood. "If we have access to a water source, I can work hard and grow more." Q: What do you grow on your farm? A: I grow greens, onions, cabbage, and peas, but there is no water. You can see I planted onions, but there is no water for them. If we have water then we can grow a little bit more. If we have access to a water source, I can work hard and grow more. Q: How much time a week or a day do you spend collecting fodder for the animals? A: It takes 2-3 hours to go down to the field every day. My daughters usually go to cut grass, and most of the time I am at home. When my daughters are busy with their studies, I do the work. One of my daughters is in Nawalpur right now for her studies. She only studies in the morning and returns home after lunch. Q: What do your children do in the farm? A: They do everything. Digging corn and taking care of the fields. Q: What hopes do you have for your daughters? What do you see for them in their future? A: My only wish is for them to find jobs. Shyam Katuwal owns and operates an organic coffee nursery in Takure. Over the last year, he has shared his experiences with Conscious Impact so that we can help connect potential coffee farmers from Takure and Bimire with a local cooperative. He is truly an inspiration. Q: Why did you start growing organic coffee? A: I have found inspiration from within myself grow coffee. For me, coffee farming is more important than life itself. I started growing coffee in the year 2043 B.S. (1986). Growing coffee is important for the bright future of children. It is good for our health to drink coffee. For families, it can be become a good source of income. From the very beginning, I have felt that coffee farming is good which is why I decided to do it. Now I am so happy and proud of myself. My sons and I have registered the name of a coffee cooperative under the name Surjya Coffee Cooperative. A young coffee tree with plenty of compost will grow be strong and produce plenty of income-generating fruit. After the registration, I now have different NGOs (non-government organizations) connecting with me. If I was only growing corn or millet no one would want to work with me. Because of coffee, Conscious Impact has also come, and I feel so happy for this to happen. Q: How has the community grown from having coffee? "The journey of coffee is longer than that of us human beings. " A: Now I am providing training for farmers on how to dig holes to plant coffee trees. With the help of trainings, coffee farming will be able to expand. But right now, we are unable to supply as much coffee as being demanded by the market. Coffee farming is so good. It is like farming for dollars. Planting trees are beneficial for our health long-term. Even if we don’t have food to eat, even if we just sit in the garden drinking water, coffee is good for us. Gardens are good for the environment because plants give us oxygen to breathe. Shelled coffee, drying on racks. Shyam sharing the coffee production process with John. A: Rice and millet farming is not sufficient to generate enough income. Our goal is to begin three-story farming: with a large tree creating shade as it grows over a coffee tree, and then a low growing plant below that; such as ginger or turmeric. Though land size never changes, the number of people we have to feed only continues to grow. By farming in this way we have enough food to feed everyone, and future generations will have a good source of income. Millet and rice is not sufficient, so this is the best way of generating income and feeding people. Shyam showing off his turmeric, a great low story plant. "Rice and millet farming is not sufficient to generate enough income... Though land size never changes, the number of people we have to feed only continues to grow. By farming in this way we have enough food to feed everyone, and future generations will have a good source of income." Until now I haven’t received any donations. I have been coffee farming by myself. I am so happy that you are all coming here and doing this interview with me, helping to promote my hard work. Coffee is life. We have to go out and cover these naked hills with coffee plants. Since you have coffee saplings, you must plant everywhere, to make everything green again. Whatever help you need, I will be here to support you. Whether it is with trainings or helping speak to people. There are so many important things that we still have to learn about coffee farming. Over the last two decades, 25% of Nepal's land has been deforested which contributes to increased landslides, loss of biodiversity, and economic downfall. Shyam and Narayan. Two friends and farmers ready to reforest their land. Coffee begins to give fruit after its 3rd year. "Coffee is life. We have to go out and cover these naked hills with coffee plants." We have already been certified internationally as organic coffee farmers. We collected soil for 3 years and tested it for being organic or not and for use of pesticides. After going through all those requirements, we were finally certified as organic. We have the certificate, and will eat organic vegetables. We are not like broiler chickens, we will make our whole lives organic and healthy. We are spreading the message of organic farming in our villages. Some people understand and some people don’t. People do not think for themselves, and so they don’t understand the importance of organic farming and why it is good for everyone and the environment. I am working so hard to convince people that we are capable of doing good, instead of bad. Shyam speaking to other farmers about the benefits of growing coffee organically. "We are spreading the message of organic farming in our villages. Some people understand and some people don’t." I started a coffee nursery in the year 2043 B.S. (1986). Now I am providing coffee trees to my friends and selling them for 15 rupees each. Since 2063 B.S. (2006), I have continually worked in the nursery and spread knowledge to my friends on how to grow coffee. I’m so happy that you came here to see all of my work from the very beginning. I feel so lucky. By unveiling my work, I am able to connect and share my story with different foreigners, donors, or organizations. This has created a good environment and strong network for me. After connecting with you [Conscious Impact], I feel I like my knowledge has increased from what it was before. Q: How has starting his own coffee cooperative changed the way he is farming coffee? A: From the very start at the beginning, we had so much difficulty selling the coffee because there was no cooperative. We first supplied coffee to Buddha Coffee Mill. I started I realized it was necessary to find constant and stable suppliers who would buy coffee. Constantly having to go to different places and people was not sustainable. After that we made 8 primary coffee cooperative groups. Now we are established and are able to supply all our coffee to this processing center in Sukute. They collect all the coffee there, divide the organic from the inorganic, and all the organic coffee is shipped to Korea and elsewhere. In this way, we directly transport our coffee to Sukute as we grow it. Shyam talking about the benefits of growing coffee with other plants. Compost tea at Shyam's farm! By connecting to this district coffee cooperative, we can create unity among us which can be hard and difficult to do. If we support each other, we can raise each other up. Some people still do not understand why I plant coffee trees. If we cover all these hills with coffee plants, we can look at it and know it is for the benefit of the Nepalese people. It is not for foreigners. Our aim is to raise awareness among people and help them to do something by themselves. Coffee is so important. "One person cannot do anything on their own. If we help each other, we are able to raise each other up." One person cannot do anything on their own. If we help each other, we are able to raise each other up. If Conscious Impact is here to help, then we are more than willing to receive it. Whether it is with our coffee or with a nursery, we are here to receive and share knowledge. We as farmers are a marginalized group. I am trying by myself to do this work, but with more energy from others, we’ll be inspired to do more. For us, coffee is our life cycle. The journey of coffee is longer than that of us human beings. People are not able to understand coffee. Our coffee is organic Arabica, and comes all the way from the Americas. The name Arabica is famous in this way. I want to thank you again; I am able to sit here and give this interview and not worry about time. There is no value of time because the life cycle is constantly going on. Narayan, Greg, and Shyam talking coffee in the Conscious Impact greenhouse. Our first coffe tree is being planted! Volunteers Meryl and Jatesh measure 6 kg of humanure per tree! Farmers sit in front of the Bimire School as we plant our first coffee tree! Greg is teaching our hardworking volunteers the importance of prepping holes for each coffee tree! Farmers from Bimire and Takure are ready to plant coffee! Thank you to everyone who has contributed to this project! On May 5th and 6th Conscious Impact, in partnership with a Nepali coffee cooperative held two local coffee trainings. One in the community of Bimire and another in Takure. We were grateful to host Ehak Prashad Bykurel from the neighboring village of Sukute to train our community. Ehak works at the processing and distribution center and trains farmers to be successful in creating their own branch of the coffee cooperative. Each farmer was trained in the history of coffee, where and what to plant with coffee, how to prepare the soil, how to take care of the tree, benefits of organic trees, and benefits of the co-op model. We will be helping the community organize into two groups of 25- 30 farmers. As a part of the training we planted our first 10 coffee trees. These are the first 10 trees of our 10,000 tree initiative. Each tree represents so much more than a tree, they will help to reforest these mid hills in the Himalayas, help mitigate climate change by sequestering carbon, and help support livelihood security by providing cash crops and making agriculture a viable way of life. We’re 10 down and 9,990 to go! We’re so excited to plant all of these trees over the next year. Learn more HERE. In the next few weeks, as monsoon rains continue to increase, we will be distributing trees to the farmers in our community. Each farmer will receive the amount of trees for the holes they have prepared. Most farmers have asked to purchase between 50 and 500 trees. It will take 3 years for the trees to reach maturity and begin producing fruit. Over the next few weeks we will begin planting new coffee seeds for next years distribution. We are also continuously planting other varieties of tree to be planted alongside coffee including neem, ippl ippl, jack fruit and other income generating trees. On May 7th we held a special training for our volunteers. Each volunteer was taught how to properly dig and prepare a hole for coffee. Each hole is prepared with a 50 cm radius and depth. The top soil is separated and each pile of soil is mixed with 3kg of compost. Our tree compost is made specifically from our composting latrines. This means that every volunteer who has pooped in our latrines is contributing to the health and longevity of each tree planted at camp! We will spend the rest of this week digging and preparing holes! Are you interested in supporting our 10,000 tree initiative? Learn more, or donate Here! Thank you! On February 4th, 2017, over 50 members from the local community gathered in Conscious Impact’s garden. Woven mats lined the ground and cob benches. The coffee was poured and the doughnuts were frying. The moment was surreal. Countless hours of hard work from hundreds of volunteers had led up to this meeting. From the moment coffee was introduced, we were aware that there was an opportunity to provide sustainable income for the community through agriculture. In January of 2016 the coffee green house was built. A beautiful structure with 20 foot tall ceilings and welded steel beams. The entire structure was fundraised and built with love from our volunteers. What followed was months of coffee care. Volunteers and locals combined spent days filling bags of soil, each receiving a small coffee seed. Once the trees began to sprout volunteers squatted for hours weeding the thousands of bags. The bags were then moved and spaced out to where they will mature. Every week they are carefully watered. After over a year of intense labor, here we were, with 8-10,000 coffee saplings and a community eager to invest. Our agriculture team was nervous, hosting a meeting in Nepal is not easy. You can’t send out an Evite to the whole community and expect them to show up. Instead we spent weeks walking door to door and speaking to community members about attending our meeting. Who decided to show up would be a direct reflection of how interested our community was in forming a cooperative. The worry faded as dozens of community members arrived with smiling faces. What was surreal about this meeting was being surrounded by the people we idol the most. The farmers we meet with every week, community members who bring us their fresh produce, the families who have been farming this land for decades before we were here. We ended our meeting with those same smiling faces wandering through our greenhouse, admiring what has emerged of countless hours of hard work. Beautiful and healthy coffee saplings. Coffee and doughnuts were served with delight to all of our local friends and families. They politely told us the coffee was only good with nearly half a cup of sugar, the same way they drink their tea. They loved the doughnuts. There’s a lot more work to come. We will continue to have meetings with the local community. We will provide them with proper training in tree maintenance. Our hope is to have a significant amount of our saplings planted by the coming monsoon season. That is going to be a lot of work for us and our community, but we are ready. Thank you to all of our volunteers near and far who made this possible. To the dedicated people who provided our trees with water and sorted each coffee sapling to ensure it would survive. A special thank you to Elpis and Dora for supporting this project with your friends and family. This meeting was successful because you were here. Shyam Katuwal beams with joy as he hands us yet another bag of ginger to take home. He is proud to show us his farm, as he should be. The Katuwal family’s organic harvest is bountiful and they have put countless hours of hard work into it. The terraces are full of ginger, turmeric, potatoes, sugar cane, bananas, chard, and coffee. All growing in perfect harmony. His family knows how to farm to a degree of perfection I can only hope to one day understand. Our own vegetable garden is growing, but not in the same way as the Katuwal families', they know this land. They know the composition of the soil, they feel the changes in the climate, and they share the same concerns for the environment as we do. In this way, we are all connected. Visiting local farmers and connecting with families through their stories allows us to grow and connect even more as a community. In the foothills of the Himalayas, Takure is a village of farmers. Land is inherited through generations and is the most precious family belonging. Everyday we are surrounded by families that rely on farming to survive. Families walk their goats past The Training Center, strong men and women carry 50kg dokos of vegetables with no pause, and our tents look over terraces full of rice, buckwheat, and millet. Local families of farmers have opened up to us in teaching about their practices. On our visits families show their land with pride and offer vegetables to taste. They tell stories of their lives before the earthquake and the hopes and dreams for their families now. In exchange we share stories of the faults of our own countries abroad. We discuss the damage chemical fertilizers and pesticides have caused in countries around the world. We discuss organic practices, climate change, and reforestation through coffee, cardamom, and other cash fruit trees. Our own vegetable garden is thriving thanks to the dedicated volunteers that care for it. Our farm is completely organic and we produce compost directly from our camp food waste. We have developed a system that guarantees as little waste as possible and we are working our hardest to leave no impact on the land. We use natural and organic fertilizers to combat ants, termites and aphids that become nuisance. By creating natural pesticides and farming organically we can see firsthand the struggles faced by local farmers when not using pesticides. We also teach our volunteers these practices to take home. People from around the world are introduced to organic farming, and can start their own vegetable gardens in their home country! I am thankful that the farmers are letting us into their homes and sharing their stories with us. Our farm visits and agriculture program have brought us even closer to the community that we admire so much. It’s about connecting with a community on a deeper level. I am grateful for the volunteers that come to Nepal eager to learn about organic farming techniques and implement them in their home country. I hope that one day our cultures from around the world are able to adapt environmentally friendly techniques and create healthy and sustaining agricultural communities.